I left my home in Fredericton, New Brunswick (Canada) and drove down Anna’s (Hartford area of Connecticut) on Thursday and early Friday morning we took the train into New York City. I don’t think either of us anticipated that NYC would be as warm as it was. By 10am it was already mid 70s (24C). We got to our hostel (Chelsea International Hostel on W20th Street) after getting our MTA (Metro Transit Authority) cards and taking the subway down from Penn Station. We lucked out that there had been a no-show the night before so the room we were supposed to be in was all clean and ready, so we got ourselves sorted and up to the top floor (walk-up) and were just hot. After a break, we got hold of Bettie who was going to take us around a walking tour of NYC, including a walk along The Highline (an old formerly abandoned elevated train line that was converted into a park / walking trail). I’ve been on parts of The Highline before with friends, but since that time, it had been completed up to W34th Street. I’ll have pictures of my New York weekend in another post. We’d picked up our tickets (held at the theatre) and then gone for supper at Junior’s at Times Square for a nice meal. I made sure of one more bathroom run; this is important as the show is 90 minutes long with no intermission and if you did have to go out they wouldn’t let you back in. Anna and I had both seen the show when the National Theatre Live broadcast it to cinemas earlier this year. It was powerful even then, seeing it on screen. However, seeing the show live was just fantastic! It’s stunning. The acting was top notch, the direction, which went with a very minimal stripped down version of the play was wonderfully done. Fabulous! I can’t recommend it highly enough – and if I weren’t a long distance away from NYC again, I’d go see it again in a heartbeat. We had asked ahead of time where the stage door was for meeting the cast after the show; it was on the next street behind (W46th). We headed back there after the show and waited in line. Fortunately for us, there were maybe only 16-17 other people besides us three. After about half an hour the cast came out and we had the chance to meet with them. 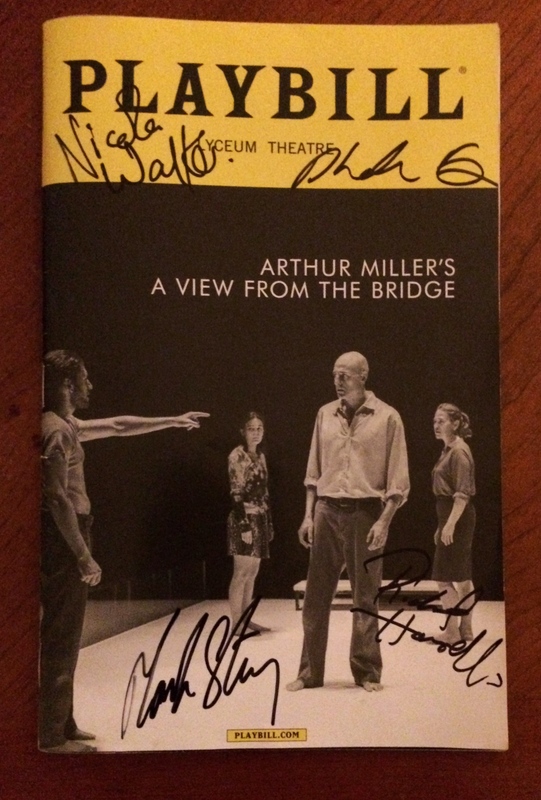 I had my Playbill and a Sharpie all ready to go and had it signed by four of the cast. 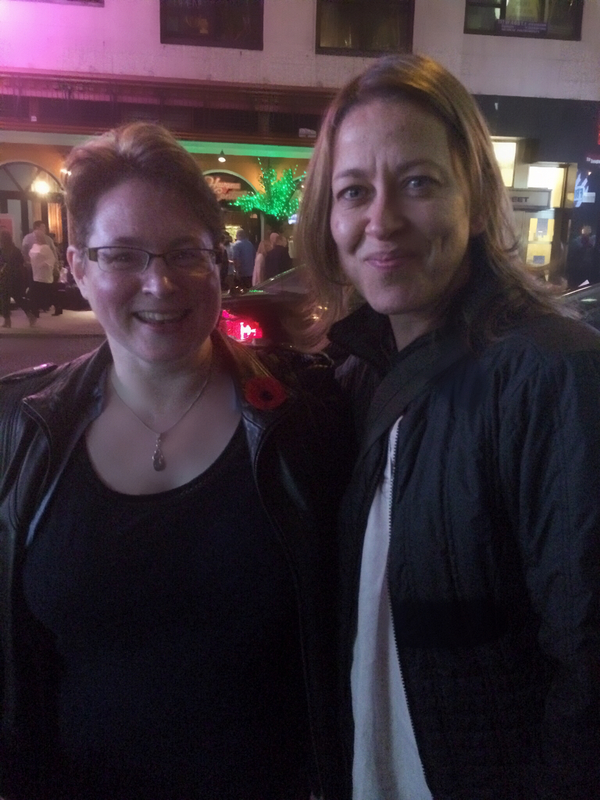 Nicola Walker was the third person we saw (I think) and wow. I’ve met other actors over the past few years but I’ve been a fan of Nicola’s for many years – and mentioned to her that I’d been watching her work since her “Touching Evil” days with Robson Green (1997-1999). We (Anna, Bettie and I) talked with Nicola for a few minutes – including me mentioning how far I’d come to see her in the show, how much we’re liking “River” and “Unforgotten”, and that we were looking forward to “Last Tango in Halifax” returning. There was a couple others that she saw then Mark Strong (who plays Eddie Carbone) came out of the stage door and we briefly spoke with him as well. After the show, and still on a happy high from meeting Nicola, Bettie, Anna and I headed back to Junior’s to get some cheesecake. While it’s not a dessert I regularly go for, that night we went with a nice rich cheesecake with cherries and cherry sauce on top. Yum. Anna and I parted ways with Bettie for the night and caught the subway back to our hostel. Still so warm we ended up keeping the window open. Oh what a night, indeed. 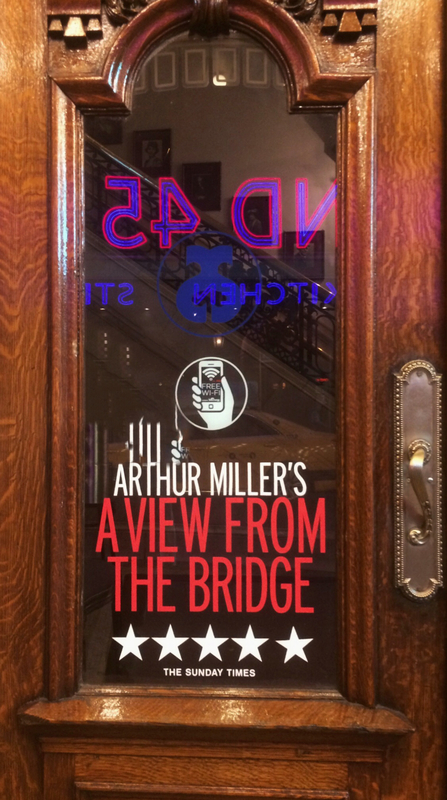 This entry was posted in Entertainment, Plays, Theatre and tagged A night on the town with friends, A View from the Bridge, Broadway, New York City, Nicola Walker, Theatre. Bookmark the permalink.